GOMACO’s new Xtreme GT-3600 curb and gutter machine will be displayed for the first time ever in GOMACO’s booth in the Central Hall at World of Concrete 2019. The GT-3600 was the first three-track machine to slipform a 24 inch (610 mm) radius, and now, with the Xtreme package on board, tight radius paving is easier and more efficient than ever before. The Xtreme package adds G+ radius software with slew drives, smart-sensored hydraulics, and intelligence to the GOMACO GT-3600. The Xtreme GT-3600 slipforms curb and gutter on a cul-de-sac in a new residential development. Xtreme steering and ultimate intelligence has been added to each of the GT-3600’s three tracks and includes rotary-sensored slew drives, sensored All-Track Steering and All-Track Positioning, and smart hydraulic cylinders. The Xtreme GT-3600’s tracks can now rotate further than ever before. The smart cylinders allow the G+ control system to know the exact position of all three tracks so it can make steering adjustments as needed. It’s the ultimate in finite and accurate machine control. The first three-track slipform curb and gutter machine to slipform a 24 inch (610 mm) radius now features GOMACO’s Xtreme Radius program for tight radii on stringline. The G+ radius software allows the operator to program the size of the radius into the controller. G+ calibrates and manages all the aspects of traveling around the radius, including track angles and individual variable track speeds. As the Xtreme GT-3600 approaches the radius, with the values already dialed in, the operator activates the radius program, and the machine slipforms around the radius. It’s that easy for any operator to pour a curb and gutter radius. The individual track speed control provides smooth machine travel around the radius. The G+ control system also easily interfaces with any of the major 3D guidance systems for the same smooth control. A smart hydraulic cylinder is also utilized for Intelligent offset when telescoping and sideshifting the mold mounting system. The smart cylinders provide G+ the ability of repeatable mold offset. The trimmerhead and mold also have independent vertical adjustments for raising and lowering to work around job-site challenges. The Xtreme GT-3600 is equipped with the latest in Tier 4 technology. Along with Tier 4 is a new optimized cooling package with a hydraulic fan controlled by G+. G+ adapts the cooling needs to individual job-site conditions for a quiet and efficient operation. Fuel efficiency has also been optimized and combined with an increased fuel capacity for an uninterrupted day of paving. The Xtreme GT-3600 is also available with GOMACO Remote Diagnostics (GRD) for machine troubleshooting, diagnostic reviews, software updates, and more. The GT-3600 will be just one of the GOMACO curb and gutter machines featuring Xtreme technology on display at World of Concrete 2019. The Xtreme Commander IIIx will be displayed slipforming a tight radius curb and gutter application, while the 3300 will be set up as a right-side pour curb and gutter machine. 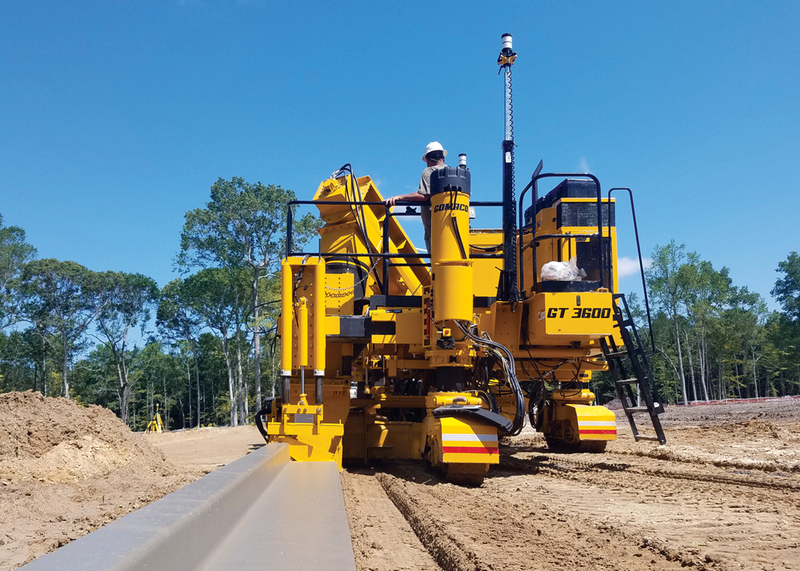 The GT-3200 is now equipped with G+ controls and a rotary sensored slew drive on its front track for maximum turning capabilities and accuracy while slipforming with a compact curb and gutter machine. It will be shown for the first time at World of Concrete. GOMACO’s smallest curb machine, the Curb Cadet, will also be featured in the World of Concrete booth. Concrete slipform placing and paving will be highlighted with the GOMACO RTP-500 rubber-tracked placer and the GP3 intelligent slipform paver. Rounding out GOMACO’s display will be a C-450 cylinder finisher for bridge deck and flat slab applications. Stop by the GOMACO booth #C5150 in the Central Hall of the Las Vegas Convention Center in Las Vegas, Nevada, January 22-25 to see GOMACO’s latest technology and to talk with our concrete paving experts about your upcoming project. GOMACO Corporation (www.gomaco.com) is the worldwide leader in concrete construction equipment with headquarters in Ida Grove, Iowa, USA. GOMACO equipment will slipform concrete streets and highways, airport runways, curb and gutter, sidewalks and recreational trails, safety barrier, bridge parapet, and irrigation canals. Support equipment includes grade trimmers, concrete placers, concrete placer/spreaders, and texturing and curing machines. The company also offers equipment to finish flat slabs, bridges, and slopes. GOMACO will consult on unique concrete paving applications and equipment needs. Products are offered through a worldwide distributor network for local sales, parts and service expertise.